The Saintes-Maries of the sea, Aigues-mortes, Le Grau du Roi. Wide expanses where the sky celebrates every day its wedding with the sea, black bulls maneuvers proudly raising their horns in lyre, graceful silhouettes of the flamingos taking off suddenly, galloping white horses, sheaves of scum: unique in the world, world apart, the Camargue forms a universe by itself. * The salt marshes, dominated by their mountains of salt. 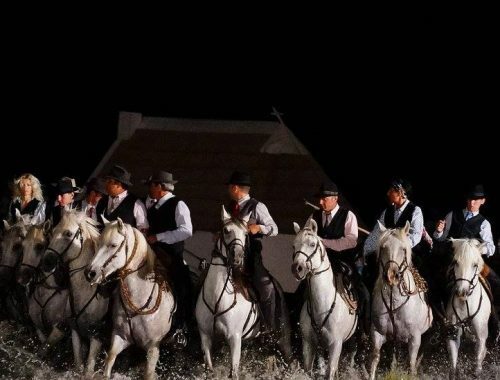 Between horses and bulls, from the House of Rice to the Camargue museum of Arles, passing by the Salins du Midi to Aiguemortes, Escapades South France, your receptive, will offer your groups & GIR a deep, playful, rewarding and gourmet discovery of this land of passion.